Everett, Wash., USA - February 12, 2016 - A combined Boeing/U.S. Air Force aircrew aboard the KC-46 tanker successfully refueled an F/A-18 aircraft in flight February 10th. 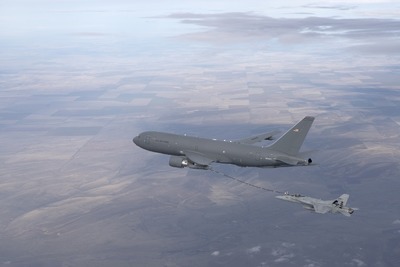 The air refueling was the program's first using the KC-46's hose and drogue system. During the 4+ hour flight, the tanker's air refueling operator smoothly transferred fuel to the F/A-18 flying at 20,000 feet. On January 24, the KC-46 refueled an F-16 fighter using its air refueling boom. 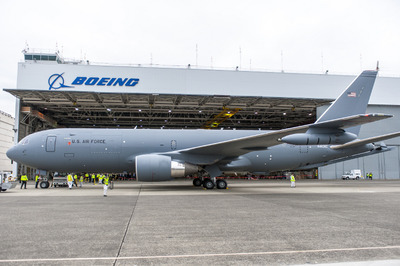 Boeing plans to build 179 KC-46 aircraft for the U.S. Air Force. 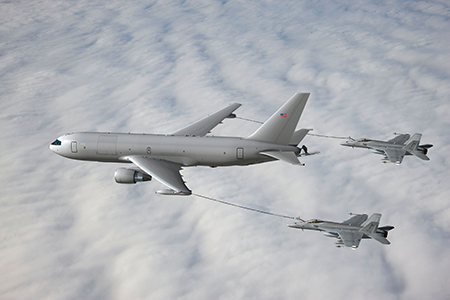 The KC-46 Pegasus tanker refuels an F/A-18 aircraft using its hose and drogue system for the first time. Boeing and Air Force aircrews successfully made contact with and refueled the fighter aircraft during the four-hour flight over Washington state. A combined Boeing/U.S. Air Force aircrew aboard the KC-46 tanker successfully refueled an F/A-18 aircraft in flight February 10th. 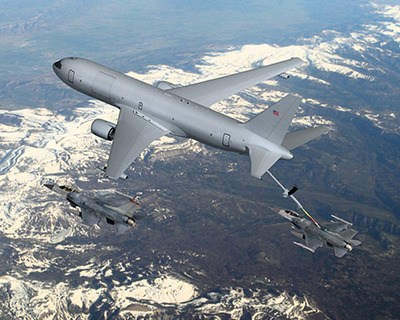 The air refueling was the program’s first using the KC-46’s hose and drogue system. 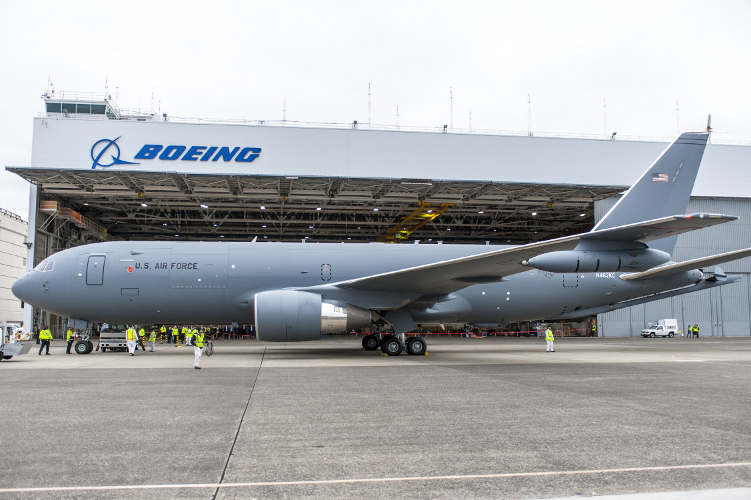 The Boeing-built KC-46A Pegasus tanker at Boeing Field, Seattle, after it's first flight. During the 4+ hour flight, the tanker’s air refueling operator smoothly transferred fuel to the F/A-18 flying at 20,000 feet. 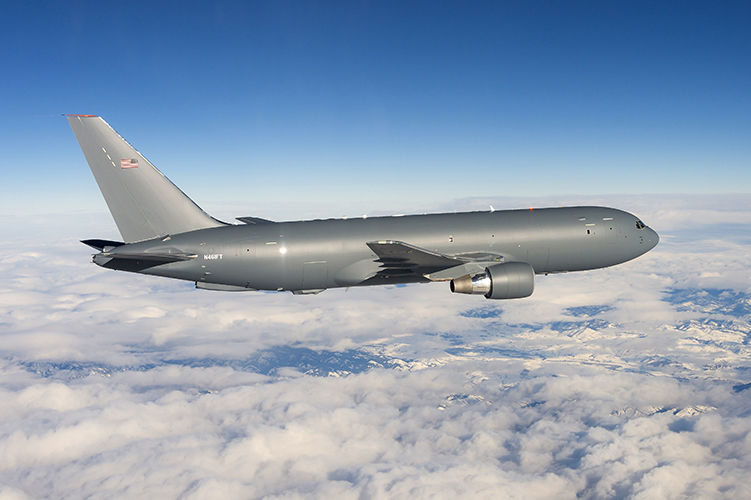 Boeing’s first KC-46 tanker test aircraft, a 767-2C, conducts testing on its inaugural flight. 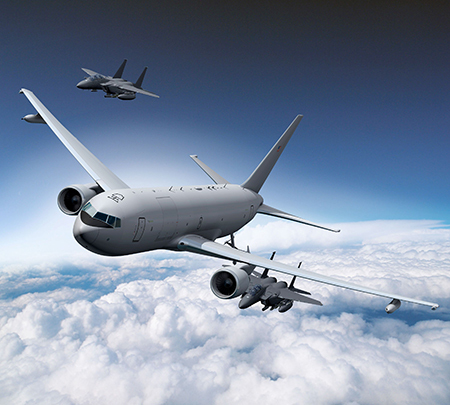 The KC-46 will refuel U.S., allied and coalition military aircraft using both its boom and hose and drogue systems. The boom allows the tanker to transfer up to 1,200 gallons of fuel per minute, while the plane’s hose and drogue systems, located on both the plane’s wing and centerline, enables the KC-46 to refuel smaller aircraft such as the F/A-18 with up to 400 gallons of fuel per minute. 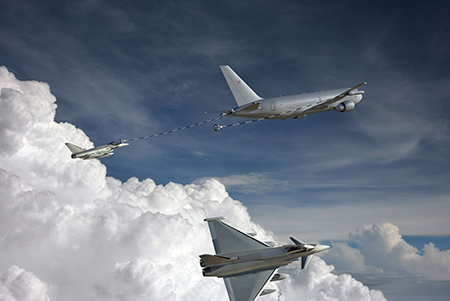 On January 24, the KC-46 refueled an F-16 fighter using its air refueling boom. The refueling flights are part of the program’s Milestone C demonstration, which will lead to a low-rate initial production decision later this year.